Method of cleansing hair comprising: (a) applying a composition to the hair; (b) dissolving and lathering the composition using a water-based solvent; (c) rinsing the hair with a water-based solvent; wherein during the rinsing a total of about 100 gram to about 300 gram of water-based solvent per gram of hair (dry weight) is employed; wherein the composition comprises from about 3 wt% to about 35 wt% of a mixture of at least two compounds of Formula I. (b)使用水基溶剂溶解所述组合物并使所述组合物起泡；(C)用水基溶剂冲洗所述毛发；其中在所述冲洗期间，每克毛发(干重)使用总计约100克至约300克的水基溶剂；其中所述组合物包含约3重量％至约35重量％的至少两种式I的化合物的混合物。 (B) a water-based solvent to dissolve the composition and foaming the composition; (C) rinsing the hair with water based solvent; wherein during the rinsing, hair per gram (dry weight) using a total of about 100 grams to about 300 grams of the water-based solvent; wherein said composition comprises a mixture of compounds.% to about 35% by weight of at least two of the formula I to about 3 wt. 通常，专门设计用于毛发的清洁组合物惯常每天使用。  Generally, specially designed for hair cleaning compositions conventionally used daily. 当清洁人的毛发时，通常将清洁组合物或洗发剂从包装中分配出来并且施用于预先润湿的毛发上。 When the cleaning of human hair, typically cleaning compositions or shampoos out and dispensed from the package applied to the pre-wetted hair. 用手将清洁组合物揉搓到毛发中并且分布至需要清洁的所有毛发。 Hand rub cleaning composition into the hair and distributed to all of the hair in need of cleaning. 通过溶解于水以及手的揉搓作用产生泡沫。 In water and rubbing action of the foam produced by dissolution hand. 当泡沫产生时，由于气泡的形成，清洁组合物的体积增加，使得它更易于铺展到整个头部毛发上。 When the foam is generated, due to the increased volume of the formation of bubbles, the cleaning composition, such that it is easier to spread onto the entire head of hair. 泡沫对于消费者而言是清洁作用发生的重要指示。 Foam for consumers is an important indication of cleaning action occurs. 在使清洁组合物清洁毛发后(通常持续几秒钟至数分钟)，使用水将所述组合物从毛发上冲洗掉。 In the cleaning composition after cleansing hair (typically a few seconds to a few minutes), using water rinsing said composition from the hair. 在促使良好清洁作用(例如界面处的堆积性，聚集能力)的表面活性剂参数与形成泡沫能力之间存在相关性。  There is a correlation between the parameters of the surfactant causes a good cleaning action (e.g., deposited at the interface, the ability to aggregate) and the ability to form a foam. 需要表面活性剂非常快速地到达气-水和污垢-水界面，这来自于表面活性剂分子在例如界面处的堆积性。 Require a surfactant gas reaches very rapidly - dirt and water - water interface, from which the bulk of the surfactant molecules at the interface, for example. 支化的表面活性剂快速且有效地到达这些界面，因为它们是单体形式，这归因于它们更加松散的堆积性(由于支链)，从而不是需要破碎以到达界面的大聚集体的一部分。 Branched surfactant rapidly and effectively reach these interfaces because they are in monomeric form, due (due branched), so you need not be broken to reach the interface portion of the large aggregates in the bulk of their looser . 然而，紧密堆积性与良好的泡沫质量相关。 However, closely related to the accumulation of good foam quality. 临界胶束浓度(CMC)与起泡速度相关，因为胶束堆积较不紧密，但是这也与较低的泡沫质量相关。 The critical micelle concentration (CMC) associated with blistering speed, because the accumulation of the micelles are less closely, but it is also associated with lower foam quality. 具有需要破碎的紧密堆积胶束(低CMC)的缺点是起泡慢，从而清洁作用较慢。 Crushing disadvantage of requiring close packing of micelles (low CMC) is slowly foamed, so that the cleaning action is slow. 由于通常造成需求增加的人口增加以及社会变得更加高度发达，基本资源如水的利用率和成本增加。  Because usually caused by population growth and increased demand society becomes more highly developed, to increase basic resources such as water utilization and costs. 此外，在`世界的一些地方例如靠近赤道的那些地方，水总是供应较为短缺的。 In addition, in some parts of the world such as `those places near the equator, the more water is always a shortage of supply. 因此，需要提供清洁毛发的方法，所述方法可在水供应短缺或相对负担不起时采用。 Thus, a need to provide clean hair, the method can be employed when water is in short supply, or can not afford relatively. 为了使用较少的水清洁毛发，所述组合物应能够在比常规组合物所需更少的水中溶解。  In order to use less water to clean hair, the compositions should be capable of dissolving in higher than conventional compositions required less water. 此外，它应在使用较少水时形成泡沫。 In addition, it should form a foam during use less water. 此外，应能够使用较少的水将所述组合物从毛发上冲洗掉。 Moreover, it should be possible to use less water rinsing said composition from the hair. 近代，期望日常家务如清洁能够尽可能快的完成。 In modern times, expect daily chores such as cleaning can be completed as quickly as possible. 就用于毛发的组合物而言，这需要更快的分解(溶解)时间、更快速的泡沫产生、和/或更快速的冲洗。 To compositions for the hair, this requires faster decomposition (dissolution) time, foam generation faster and / or more rapid flushing. 最后，需要寻求可来源于自然和可再生来源的清洁活性物质。 Finally, you may need to seek active substances derived from natural and clean renewable sources. 其中相对于所述化合物中的至少一种:当R1为H时，则R2具有1、2或3个(C1-C3)烷基支链，并且当R1为甲基或乙基时，则R2`具有O、I或2个(C1-C3)烷基支链。  wherein with respect to at least one of the compounds: methyl or ethyl when R1 is H, R2 is 1, 2 or 3 (C1-C3) branched alkyl, and when R1 is , having the R2` O, I, or 2 (C1-C3) alkyl branching. 在第二方面，本发明涉及清洁毛发的组合物，其中所述组合物溶解于具有约0.1秒至约300秒的溶解时间的水基溶剂中，其中所述组合物包含约3重量％至约35重量％的如上所述的至少两种式I的化合物的混合物。  In a second aspect, the present invention relates to a hair cleaning composition, wherein the composition is dissolved in a water-based solvent having a dissolution time of about 0.1 seconds to about 300 seconds, where the composition comprises from about 3 wt. % mixture of the compound to about 35% by weight of at least two of the above formula I. 在第三方面，本发明涉及组合物用于清洁毛发的用途，其中所述组合物溶解于具有约0.1秒至约300秒的溶解时间的水基溶剂中，其中所述组合物包含约3重量％至约35重量％的如上所述的至少两种式I的化合物的混合物。  In a third aspect, the present invention relates to the use of compositions for cleaning the hair, wherein said composition is dissolved in a water-based solvent having a dissolution time of about 0.1 seconds to about 300 seconds, where the composition comprises the mixture of compounds from about 3% to about 35% by weight of at least two of the above formula I. 图1示出三种不同组合物冲洗次数对摩擦力的图示。  FIG. 1 shows three different times rinsing composition illustration of friction. X轴为梳子/刷子的行程数，而y轴为摩擦力(以克力为单位)。 X axis is a comb / brush stroke number, while the y-axis frictional force (in units of grams force). 组合物A和B是依照本发明的。 A and B are compositions in accordance with the present invention. 组合物C不是依照本发明的。 Composition C is not in accordance with the present invention. 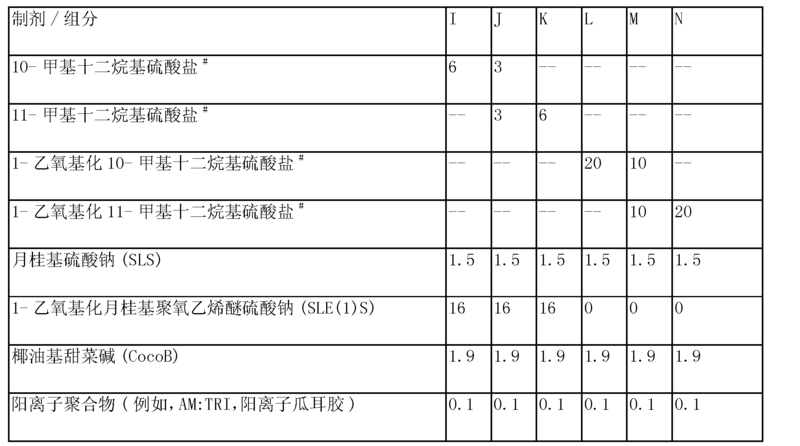 除非另行指出，所有百分比均按所述总组合物的重量计。  Unless stated otherwise, all percentages are by weight of the total composition. 除非另外特别说明，所有比率均为重量比。 Unless specifically stated otherwise, all ratios are weight ratios. 所有均包括或结合端值在内。 All ranges are inclusive and combinable included. 有效位数表示既不限制所指示的量也不限制测量精度。 Represents neither to limit the number of significant digits indicated amounts nor on the accuracy of the measurement limits. 除非另行指出，如本文所用，术语“分子量”或“M.Wt.”是指重均分子量。 Unless stated otherwise, as used herein, the term "molecular weight" or "M.Wt." means weight average molecular weight. 除非另外特别说明，所有数值应理解为可被词“约”修饰。  Unless otherwise indicated, all numerical amounts are understood to be modified by the word "about." 除非另外指明，所有测量均被理解为是在25°C和环境条件下进行的，其中“环境条件”是指在约一大气压和约50%相对湿度下的条件。 Unless otherwise specified, all measurements are understood to be carried out at 25 ° C under ambient conditions and, where "ambient conditions" means conditions under about one atmosphere and about 50% relative humidity at. 除非另外指明，所有与所列成分相关的上述重量均基于活性物质的含量，并且不包括可能包括在可商购获得的原料中的载体或副产物。 Unless otherwise specified, all the above weights as they pertain to listed ingredients are based on the active level and do not include carriers or by-products may include the commercially available starting material in. 本文中，“包括/包含”是指可加入不影响最终结果的其它步骤和其它成分。  As used herein, "comprises / comprising" means that other steps may be added does not affect the end result and other ingredients. 该术语包括术语“由…组成”和“基本上由…组成”。 This term encompasses the terms "consisting of ..." and "consisting essentially of ...." 本发明的组合物、方法、用途、套盒和制程可包括、由和基本上由本文所述的本发明基本成分和限制条件以及本文所述的任何附加或任选成分、组分、步骤或限制条件组成。 The composition of the present invention, methods, uses, kits, and processes can comprise, consist of, and substantially described herein and limitations of the essential elements of the present invention described herein, and any additional or optional ingredients, components, steps, or limitations described herein. 如本文所用，术语“基本上没有”或“基本上不含”是指按所述组合物的总重量计小于约1%，或小于约0.8%，或小于约0.5%，或小于约0.3%，或约0%。  As used herein, the term "substantially free" or "substantially free" means that the total weight of the composition is less than about 1%, or less than about 0.8%, or less than about 0.5%, or less than about 0.3%, or about 0%. 如本文所用，“毛发”是指哺乳动物的毛发，包括头皮毛发、面部毛发和身体毛发，尤其是人头部和头皮上的毛发。  As used herein, "hair" refers to mammalian hair, including scalp hair, facial hair and body hair, in particular human hair on the head and scalp. 如本文所用，“近端支化”脂肪酸、脂肪醇，以及脂肪酸和醇的衍生物(即“近端支化化合物”)在最长链的未官能化端的40%范围内的碳原子上包含1、2或3个(C1-C3)烷基支链。  As used herein, "proximal branched" fatty acids, fatty alcohols, fatty acids and alcohols as well as derivatives (i.e., "proximal branched compound") is in the range of 40% carbon unfunctionalized end of the longest chain comprising 1, 2 or 3 (C1-C3) branched alkyl chain atoms. 近端支化脂肪酸、脂肪醇以及脂肪酸和醇的衍生物的官能化端是包含酸、醇或衍生部分的末端。 Branched proximal end functionalized end fatty acids, fatty alcohols and derivatives of fatty acids and alcohols containing an acid, an alcohol or derivatized terminal portion. 碳主链末端的未官能化碳被称为位。 Unfunctionalized carbon carbon main chain terminal is called a bit. 例如，具有10个碳原子链长的近端支化化合物可具有至多《_3位支化，而链长30个碳原子的近端支化化合物可具有至多03-11位支化。 For example, having a chain length of 10 carbon atoms, branched proximal compound may have at most "_3 branching position, the proximal end of a chain length of 30 carbon atoms may be branched compound having a branched up to 03-11 bits. 本文近端支化化合物通常在化合物的《_1、《_2、w-3> (0-4、co-5、和/或co-6位，或在《_1、《 _2、和/或co-3位,或在《-1和/或Co-2位具有支链。 Branched compounds herein usually proximal "_1," _ 2, w-3> (0-4, co-5, and / or co-6-position or in the "_1" _2, and / or co- compound 3, or the "-1 and / or Co-2 bits have a branched chain. 在Co -1位具有支链的近端支化化合物被称为“异”。  is referred to as "exclusive" in the position proximal Co -1 branched compound having a branched chain. 在《 -2位具有支链的近端支化化合物被称为“反异”。 In "-2 position of the proximal end having a branched-chain branched compounds are referred to as" anteiso. " 例如在其碳主链中具有10个碳原子，并且在位上具有甲基支链的化合物:支链位于碳链的未官能化端的40%范围内(例如2/10X 100%=20%)，并且被称为是近端支化的。 For example having 10 carbon atoms in its carbon backbone, and the compound having the bit methyl branch: the range of 40% in the carbon chain of the non-functionalized end branched (e.g. 2 / 10X 100% = 20%) , and it is known as the proximal end branched. 相比之下，在其碳主链中具有10个碳原子，并且在《-4位上具有甲基支链的化合物-支链不在碳链的未官能化端的40%范围内(例如5/10 X 100%=50%)，因此不被称为“近端支化的”。 In contrast, having 10 carbon atoms in its carbon backbone, and the compound having a methyl branch at the "position -4 - within the range of 40% non-functionalized end not branched carbon chains (e.g., 5 / 10 X 100% = 50%), and therefore will not be called "proximal branching." 如本文所用，术语“烷基”是指直链和支化饱和烃基。  As used herein, the term "alkyl" refers to straight and branched chain saturated hydrocarbon. 如本文所用，术语“烯基”的定义与“烷基”相同，不同的是包含碳-碳双键，例如乙烯基、丙烯基和丁烯基。 As used herein, the definition of the term "alkenyl group" and "alkyl", except that the carbon-containing - carbon double bonds, such as vinyl, propenyl and butenyl. 如本文所用，“直链”脂肪酸、脂肪醇，以及脂肪酸和醇的衍生物(即“直链化合物”)在碳链上没有支链。  As used herein, "linear" fatty acid, fatty alcohols, fatty acids and alcohols as well as derivatives (i.e., "linear compound") is not branched on the carbon chain. 如本文所用，“中链”支化的脂肪酸、脂肪醇，以及脂肪酸和醇的衍生物(即“中链支化化合物”)在碳主链的未官能化端约40%至约60%范围内的碳原子上包含烷基支链。  As used herein, "medium-chain" branched fatty acids, fatty alcohols, fatty acids and alcohols as well as derivatives (i.e., "mid-chain branched compound") end of the non-functionalized carbon backbone of from about 40% to about carbon atoms in the range of 60% comprises branched chain alkyl. 例如，链长12个碳原子的中链支化化合物可在《-5和/或《-6位具有支链。 For example, a chain length of 12 carbon atoms in the branched chain compounds can be "-5 and / or" -6 bits branched. 链长30个碳原子的中链支化化合物可在《_12至《-17位具有支链。 A chain length of 30 carbon atoms in the branched chain compounds can be "_12 to" -17 bits branched. 如本文所用，“美容上可接受的”是指所述组合物、制剂或组分适用于与人类的角质组织接触，而没有不适当的毒性、不相容性、不稳定性、变应性反应等。  As used herein, "cosmetically-acceptable" means that the compositions, preparations or components suitable for use in contact with human keratinous tissue without undue toxicity, incompatibility, instability, allergic reactions. 旨在直接施用于角质组织的本文所述所有组合物限于美容上可接受的那些。 Used herein is intended to be applied directly to the keratinous tissue of all compositions is limited to those cosmetically acceptable. 如本文所用，“碳主链”是指化合物中的碳主链。  As used herein, "carbon backbone" refers to carbon backbone compounds. 如本文所用，“衍生物”包括但不限于指定化合物的酰胺、醚、酯、氨基、羧基、乙酰基、和/或醇衍生物。  As used herein, "derivatives" includes but is not limited to specified amide compound, an ether, an ester, an amino group, a carboxyl group, an acetyl group, and / or an alcohol derivative. 如本文所述，清洁组合物提供优异的性能有益效果。  As described herein, the composition provide excellent cleaning performance benefits. 这些有益效果包括:优异的快速分解(溶解)并且需要比常规清洁组合物更少的水来溶解；快速泡沫生成，使得起泡时间较短；快速并且彻底冲洗，使得冲洗时间较短。 These benefits include: excellent rapid decomposition (dissolution) and needs to be dissolved than conventional cleaning composition less water; fast foam generating such a short blowing time; fast and thoroughly washed, so that the flushing time is shorter. 此外，所述组合物在低温下稳定并且耐受硬水条件。 Furthermore, the composition is stable at low temperatures and hard water tolerance conditions. 不受理论的约束，发明人相信，与直链化合物相比，支化化合物堆积效率不高。 Constraints  by theory, the inventors believe that, compared with the linear compounds, branched compound deposition efficiency is not high. 堆积效率取决于化合物中支链的位置和支链的大小。 Packing efficiency depends on the size and position of the branched compound of branches. 有效堆积与良好的起泡性和清洁性相关，但是过度的有效堆积造成结晶，因此使得所期望的溶解减少，使得所期望的冲洗性降低，并且使得所期望的起泡动力学降低。 Associated with efficient packing and good lathering cleanability, but the excessive accumulation caused crystallization effective, so that a desired dissolution reduction, so that the desired flushing is reduced, so that the desired foaming and reduced kinetics. 本发明人还发现，堆积度可通过优化支化化合物与直链化合物的比率来调节，并且还可通过支化化合物中支链的位置来调节。 The present inventors also found that the degree of packing can be adjusted by optimizing the ratio of the branched compound to a linear compound, and may also be adjusted by the position of branches branched compounds. 组合物中存在直链化合物，提供对支化化合物有益效果的优化。 Linear compounds present in the composition, to provide optimized benefits branched compounds. 第一方面涉及清洁毛发的方法，所述方法包括将组合物施用到所述毛发。  The first aspect relates to a method of cleansing hair, said method comprising applying the composition to the hair. 所述方法还包括使用水基溶剂溶解所述组合物并使所述组合物起泡。 The method further comprises a water-based solvent to dissolve the composition and the foaming composition. 在一个实施方案中，所述水基溶剂为至少约50重量％,或至少约60重量％,或至少约70重量％,或至少约80重量％,或至少约90重量％的水。 In one embodiment, the water-based solvent is at least about 50 wt%, or at least about 60 wt%, or at least about 70 wt%, or at least about 80 wt%, or at least about 90% by weight of water. 在一个实施方案中，溶解包括约0.1秒至约300秒，或约50秒至约250秒，或约100秒至约200秒，或约120秒至约180秒，或约150秒至约160秒的溶解时间。  In one embodiment, the dissolution comprises about 0.1 seconds to about 300 seconds, or from about 50 seconds to about 250 seconds, or from about 100 seconds to about 200 seconds, or from about 120 seconds to about 180 seconds, or from about 150 seconds dissolution time to about 160 seconds. 如本文所用，“溶解时间”为组合物完全分散于水中所花费的时间。 As used herein, "dissolution time" of the composition dispersed throughout the time spent in the water. 溶解时间可通过测定水溶液中的电导变化来测定。 Dissolution time can be determined by measuring the change in conductance of the aqueous solution. 随着组合物的溶解，电导系数因溶液中存在更多的离子而增加。 With the dissolution of the composition, the presence of more ionic conductance by the solution increases. 当组合物完全溶解并且为溶液形式时，电导系数值达到最终并且恒定的数值。 When the composition is completely dissolved and in solution, to a final conductivity coefficient values ​​and a constant value. 因此，溶解时间的测量起始于你将组合物加入到水中时，并且终止于电导系数达到其最终值。 Thus, in measuring the dissolution time you start the composition when added to water, and terminates in electrical conductance reaches its final value. 这是溶解时间的技术量度，并且与实际消费者溶解时间相关。 This is a technical measure of the time of dissolution, and the dissolution time correlation with actual consumer. 然而，不同的消费者将不同的能量(例如通过将他们的手放在一起摩擦)导入到组合物/溶剂中，但是改善的技术溶解时间获得改善的消费者用溶解时间。 However, various different energy consumers (e.g., by rubbing their hands together on) introduced into the composition / solvent, but improvement in the art dissolution time consumers with improved dissolution times. 在一个实施方案中，起泡包括约0.1秒至约80秒，或约2秒至约60秒，或约5秒至约50秒，或约10秒至约30秒的起泡时间，以使包含总计0.19克表面活性剂的组合物达到总计200mL的泡沫体积。  In one embodiment, the blister comprises from about 0.1 seconds to about 80 seconds, or from about 2 seconds to about 60 seconds, or from about 5 seconds to about 50 seconds, or from about 10 seconds to about 30 seconds Bubble Time , so that contains a total of 0.19 g of the surfactant composition reaches a total of 200mL of foam volume. 如本文所用，“起泡时间”是泡沫体积随着使用而增加的快速程度。 As used herein, "foaming time" foam volume increases with use and how quickly. 起泡时间可通过使用机械产生泡沫的仪器来测定。 Blowing time may be determined by using a mechanical foaming device. 如果组合物在更快产生泡沫方面(机械作用时间)显示出优势，则它与更易于在消费者使用期间产生泡沫相关。 If the composition in terms of generating foam (mechanical action time) shows the advantages of faster, then it is easier to produce foam during the relevant consumer. 可测定随时间推移的泡沫体积，并且与同时测定的多种不同组合物进行比较。 Foam volume can be measured over time, and compared to the simultaneous determination of a plurality of different compositions. 可测定具体时间点例如20秒后两种不同组合物之间泡沫体积的差值，作为另外一种选择，可测定达到具体泡沫体积所花费的时间。 Determination particular point in time may be, for example, the difference between two different volume of the foam composition after 20 seconds, alternatively, may be measured to reach the specific time it takes the foam volume. 所述方法还包括用水基溶剂冲洗毛发。  The method further comprises rinsing the hair with water based solvent. 在一个实施方案中，在冲洗期间，每克毛发(干重)使用总计约120克至约270克，或140克至约250克，或150克至约240克，或约160克至约230克，或约170克至约210克，或180克至约200克的水基溶剂。 In one embodiment, during the flushing, per gram of hair (dry weight) using a total of about 120 grams to about 270 grams, or 140 grams to about 250 grams, or 150 grams to about 240 grams, or from about 160 g to about 230 grams, or from about 170 grams to about 210 grams, or 180 grams to about 200 grams of the water-based solvent. 所述组合物包含约3重量％至约35重量％的如上所述的至少两种式I的化合物的混合物。 A mixture of compounds  The composition comprises from about 35 wt.% To about 3% by weight of the above Formula I of at least two. 在一个实施方案中，所述组合物包含约4重量％至约34重量％,或约5重量％至约30重量％,或约10重量％至约28重量％,或约20重量％至约25重量％的如上所述的至少两种式I的化合物的混合物。 In one embodiment, the composition comprises from about 4 wt% to about 34 wt%, or about 5 wt% to about 30 wt%, or from about 10 wt% to about 28% by weight, or from about 20 wt% to about a mixture of at least one compound of formula I two 25 wt% as described above. 在一个实施方案中，所述组合物包含至少一种根据式I的直链化合物和至少一种根据式I的支化化合物。  In one embodiment, the composition comprises at least one linear chain compound of Formula I and at least one branched compound according to formula I. 在根据式I的直链化合物中=R1为H ;并且R2为(C1-Cn)烷基或(C1-Cn)烯基且在所述碳链上不含支链。 In the linear compounds of Formula I = R1 is H; and R2 is (C1-Cn) alkyl or (C1-Cn) alkenyl group and no branching on the carbon chain. 在一个实施方案中，所述直链化合物与支化化合物的重量比(直链:支化)为约10:1至约1:2，或约5:1至约1:1，或约4.5:1至约1.75:1，或约3.5:1至约2.5:1。  In one embodiment, the linear compound to a branched compound weight ratio (linear: branched) is from about 10: 1 to about 1: 2, or from about 5: 1 to about 1: 1, or from about 4.5: 1 to about 1.75: 1, or from about 3.5: 1 to about 2.5: 1. 在一个实施方案中，支化化合物选自:近端支化化合物；中链支化化合物；以及它们的混合物。  In one embodiment, the branched compound is selected from: the proximal end of the branched compound; mid-chain branched compounds; and mixtures thereof. 在一个实施方案中，支化化合物为近端支化化合物。 In one embodiment, the proximal end of the branched compound is a branched compound. 在一个实施方案中，支化化合物包含至少一个位于选自以下的位置的支链:w-1、0-2、《-3、w-4、w-5和(0-6 ;或«-1、《-2和《-3;或GJ-1和《-2。在一个实施方案中，支化化合物仅包含一个支链，其中所述支链位于选自以下的位置-1、《_2和《_3 ;或《-1和《-2。所述组合物可基本上不含既不是近端支化化合物也不是中链支化化合物的任何支化化合物。在一个实施方案中，所述组合物基本上不含中链支化化合物。 In one embodiment, the branched compound containing at least one branched chain is located in a position selected from: w-1,0-2, "- 3, w-4, w-5 and (0-6; or« - 1, "- 2" -3; or GJ-1 and. "-2 in one embodiment, the branched compound comprises only one branch, wherein said selected branch is located at position -1," _ 2 and "_3; or." 1 and "-2 the composition may be substantially free of branched compounds are neither proximal nor any branching chain branched compounds in one embodiment the compounds of embodiment, the. composition is substantially free of chain branching compound. 在一个实施方案中，支化化合物包含支链，其中所述支链选自:甲基和乙基支链，或其中所述支链为甲基支链。  In one embodiment, the branched compound comprising a branched chain, wherein the branched chain is selected from: methyl and ethyl branches, or wherein the branches are methyl branches. 所述支链可仅包含碳和氢原子。 The branch may comprise only carbon and hydrogen atoms. 在一个实施方案中，支化化合物选自:10_甲基十二烷基硫酸钠或硫酸铵盐、11-甲基十二烷基硫酸钠或硫酸铵盐、乙氧基化10-甲基十二烷基硫酸钠或硫酸铵盐、1-乙氧基化11-甲基十二烷基硫酸钠或硫酸铵盐，以及它们的混合物。 In one embodiment, the branched compound is selected from: 10_ methyl dodecyl sulfate or ammonium sulfate, 11-methyl ammonium salt or sodium lauryl sulfate, 10-methyl ethoxylated sodium lauryl sulfate or ammonium sulfate, 11-methyl-1- ethoxylated lauryl sulfate or ammonium salts, and mixtures thereof. 此类支化化合物可采用下文合成信息合成，和/或购自Aldrich以及其它专业化学品制造商。 Such compounds can be branched following composition information synthesis, or purchased from Aldrich and other specialty chemicals, and manufacturer /. 在一个实施方案中，直链化合物为包含12个至14个碳原子的阴离子表面活性剂的盐。  In one embodiment, a straight chain compound is an anionic surfactant comprises from 12 to 14 carbon atoms and salts thereof. 直链化合物可选自:月桂基硫酸钠、月桂基聚氧乙烯醚硫酸钠、十三烷基硫酸钠、十三烷基聚氧乙烯醚硫酸钠、十四烷基硫酸钠、十四烷基聚氧乙烯醚硫酸钠，以及它们的混合物。 Straight-chain compound selected from the group: sodium lauryl sulfate, polyoxyethylene lauryl ether sulfate, sodium tridecyl sulfate, polyoxyethylene tridecyl ether sulfate, sodium tetradecyl sulfate, sodium tetradecyl polyoxyethylene ether sulfate, and mixtures thereof. 1.5%至约16%，或约1.5%至约8%的高熔点脂肪族化合物。 1.5% to about 16%, or from about 1.5% to about 8% of the high melting point fatty compound. 在一个实施方案中，脂肪醇选自:鲸蜡醇、硬脂醇、二十二醇，以及它们的混合物。 In one embodiment, the fatty alcohol is selected from: cetyl alcohol, stearyl alcohol, behenyl alcohol, and mixtures thereof. 所述组合物可以包含阳离子聚合物。 The  compositions may comprise a cationic polymer. 所述组合物可包含按所述组合物的总重量计约0.05%至约3%，或约0.075%至约2.0%,或约0.1%至约1.0%的阳离子聚合物。 The composition may comprise total weight of the composition, from about 0.05% to about 3%, or from about 0.075% to about 2.0%, or from about 0.1% to about 1.0% cationic polymer. 阳离子聚合物在所述组合物预期用途的pH下可具有约0.5meq/g至约7meq/g,或约0.9meq/g至约5meq/g,或约1.2meq/g至约4meq/g的阳离子电荷密度,所述pH —般在约pH3至约pH9范围内，或介于约PH4和约pH8之间。 The cationic polymer at the pH of intended use of the composition may have from about 0.5meq / g to about 7meq / g, or from about 0.9meq / g to about 5meq / g, or from about 1.2meq / g to about 4meq / g of cationic charge density, the pH - generally from about pH3 to about pH9 range, or between about PH4 about pH8. 本文，聚合物的“阳离子电荷密度”是指聚合物上的正电荷数与聚合物重均分子量的比率。 Herein, "cationic charge density" of a polymer refers to the ratio of the number of positive charges on the polymer weight average molecular weight of the polymer. 阳离子聚合物的重均分子量可介于约10，000和I千万之间，或介于约50，000和约5百万之间，或介于约100，000和约3百万之间。 A weight average molecular weight of the cationic polymer is between about 10,000 and I millions, or between about 50,000 and about 5 million or between about 100,000 and about 3 million. 适宜的阳离子聚合物可包含阳离子含氮部分如季铵或阳离子质子化氨基部分。  Suitable cationic polymers may contain cationic nitrogen-containing moieties such as quaternary ammonium or cationic protonated amino moieties. 所述抗衡离子可选自:卤离子(例如氯离子、氟离子、溴离子、碘离子)、硫酸根、甲硫酸根，以及它们的组合。 The counterion may be selected from: halides (e.g., chloride, fluoride, bromide, iodide), sulfate, methosulfate, and combinations thereof. 阳离子聚合物可选自:多糖聚合物、阳离子瓜尔胶衍生物、含季氮纤维素醚、合成聚合物、醚化纤维素、瓜尔胶和淀粉的共聚物，以及它们的组合。 Cationic polymer selected from: polysaccharide polymers, cationic guar gum derivatives, quaternary nitrogen-containing cellulose ethers, synthetic polymers, cellulose ethers, copolymers of guar and starch, and combinations thereof. 阳离子聚合物应溶解于所述组合物中，或溶解于所述组合物的复合聚集体相中，所述组合物由阳离子聚合物与阴离子、两性和/或两性离子表面活性剂形成。 Cationic polymers should be soluble in the composition, or dissolved complex aggregates in the phase of the composition, the composition is formed by the cationic polymer and anionic, amphoteric and / or zwitterionic surfactants. 阳离子聚合物的复合聚集体也能与组合物中的其它带电物质形成。 Complex aggregates of the cationic polymer can also be formed in combination with other charged materials in the composition. 在一个实施方案中，阳`离子聚合物为阳离子表面活性剂。  In one embodiment, the male `ionic polymer is a cationic surfactant. 阳离子表面活性剂可选自:二十二烷基三甲基氯化铵、二十二烷基三甲基甲酯硫酸铵或二十二烷基三甲基乙酯硫酸铵，以及硬脂基三甲基氯化铵、硬脂基三甲基甲酯硫酸铵或硬脂基三甲基乙酯硫酸铵。 Cationic surfactants selected from: behenyl trimethyl ammonium chloride, behenyl trimethylammonium methosulfate, behenyl trimethylammonium or ethyl sulfate, stearyl and trimethyl ammonium chloride, stearyl methyl sulfate or stearyl trimethyl ammonium methacrylate. 据信，与具有较短烷基的阳离子表面活性剂相比，较长的烷基在湿发和干发上提供改善的光滑度和柔软感。 It is believed that, compared to cationic surfactants having a shorter alkyl group, an alkyl longer provide improved smoothness and softness on wet and dry hair. 还据信，与具有较短烷基的那些相比，此类阳离子表面活性剂可提供刺激性的降低。 It is also believed, compared to those, such cationic surfactants can provide reduced irritation having a shorter alkyl group. 氨基胺。 Amidoamines. 叔酰氨基胺可选自:硬脂酰胺基丙基二甲基胺、硬脂酰胺基丙基二乙基胺、硬脂酰胺基乙基二乙基胺、硬脂酰胺基乙基二甲基胺、棕榈酰胺基丙基二甲基胺、棕榈酰胺基丙基二乙基胺、棕榈酰胺基乙基二乙基胺、棕榈酰胺基乙基二甲基胺、山嵛酰胺基丙基二甲基胺、山嵛酰胺基丙基二乙基胺、山嵛酰胺基乙基二乙基胺、山嵛酰胺基乙基二甲基胺、二十烷酰胺基丙基二甲基胺、二十烷酰胺基丙基二乙基胺、二十烷酰胺基乙基二乙基胺、和二十烷酰胺基乙基二甲基胺、二乙基氨基乙基硬脂酰胺，以及它们的混合物。 Tertiary amido amines selected from: stearyl amidopropyl dimethyl amine, stearyl amidopropyl diethylamine, stearamide ethyl diethyl amine, dimethyl stearyl amido ethyl amine, palmityl amido propyl dimethyl amine, palmityl amidopropyl diethylamine, palmityl amido ethyl-diethyl amine, palmityl amido ethyl dimethyl amine, behenyl amidopropyl dimethyl amine, behenyl amidopropyl diethylamine, behenic amido ethyl-diethylamine, behenic amido ethyldimethylamine, eicosanoic amidopropyl dimethylamine, twenty alkyl amidopropyl diethylamine, eicosanoic amido ethyl-diethylamine, and twenty-alkylamido dimethyl ethyl amine, diethylaminoethyl stearamide, and mixtures thereof. 阳离子表面活性剂可为二长链烷基季铵化铵盐，其选自:二烷基(14-18) 二甲基氯化铵、二牛油烷基二甲基氯化铵、二氢化牛油烷基二甲基氯化铵、二硬脂基二甲基氯化铵、双十六烷基二甲基氯化铵，以及它们的混合物。  Cationic surfactants may be di-long chain alkyl quaternary ammonium salt, selected from: dialkyl (14-18) dimethyl ammonium chloride, ditallow alkyl dimethyl ammonium chloride , dihydrogenated tallow alkyl dimethyl ammonium chloride, distearyl dimethyl ammonium chloride, dicetyl dimethyl ammonium chloride, and mixtures thereof. 所述组合物可包含调理剂。 The  composition may comprise a conditioning agent. 所述调理剂可包括水不溶性、水可分散性、非挥发性、形成乳化液体颗粒的液体。 The conditioning agent may include water-insoluble, water-dispersible, non-volatile, liquid that forms emulsified, liquid particles are formed. 所述调理剂可为硅氧烷(例如硅油、阳离子硅氧烷、硅橡胶纯胶料、高折射率硅氧烷和有机硅树脂)、有机调理油(例如烃油、聚烯烃和脂肪酸酯)、或它们的组合，或其它情况下在本文含水表面活性剂基质中形成液体分散颗粒的那些调理剂。 The silicone conditioning agent may be (e.g. silicone oils, cationic silicones, silicone gums, high refractive silicones, and silicone resins), organic conditioning oils (e.g. hydrocarbon oils, polyolefins, and fatty esters under), or combinations thereof, or those conditioning agents other case of forming a liquid, dispersed particles in the aqueous surfactant matrix herein active agent. 硅氧烷调理剂的浓度按所述组合物的总重量计可为约0.01%至约10%，或约0.1%至约5%。 Concentration of the silicone conditioning agent based on the total weight of the composition, may be from about 0.01% to about 10%, or about 0.1% to about 5%. 适宜的硅氧烷调理剂和硅氧烷的任选混悬剂描述于US5, 104, 646中。 Suitable silicone conditioning agents and silicone suspending agents optionally are described in US5, 104, 646 in. 在一个实施方案中，所述组合物包含硅橡胶纯胶料，其选自:聚二甲基硅氧烷、(聚二甲基硅氧烷)(甲基乙烯基硅氧烷)共聚物、聚(二甲基硅氧烷)(二苯基硅氧烷)(甲基乙烯基硅氧烷)共聚物，以及它们的混合物。 In one embodiment, the composition comprises a silicone gum selected from: polydimethylsiloxanes, (polydimethylsiloxane) (methylvinylsiloxane) copolymer, poly (dimethylsiloxane) (diphenyl siloxane) (methylvinylsiloxane) copolymer and mixtures thereof. 其中G为氢、苯基、羟基或C1-C8烷基，优选甲基；a是值为I至3，优选I的整数；b为O、I或2，优选I ;n为0至1，999的数况为符合通式CqH2qL的一价基团，其中q是值为2至8 的整数，并且L 选自以下基团:-N (R2) CH2-CH2-N (R2)2「N (R2)2 ；-N (R2)3A^ ；-N (R2)CH2-CH2-NR2H2A^ ;其中R2为氢、苯基、苄基或饱和烃基，优选约C1至约C2tl烷基；A_为卤离子。在一个实施方案中，末端氨基硅氧烷符合如上所述的式III，其中G为甲基^为I ;b为I ;n为200至1000的数况为符合通式CqH2qL的一价基团，其中q是值为2至8的整数，并且L选自以下基团:_N(R2)CH2-CH2-N(R2)2 -N(R2)2 ；-N(R2)3A^ -N(R2)CH2-CH2-NR2H2A^ ;其中R2 为约C1至约C2tl烷基；A_为卤离子。  wherein G is hydrogen, phenyl, hydroxy, or C1-C8 alkyl, preferably methyl; a is a value of I to 3, preferably an integer I; b. Is O, I, or 2, preferably I; n-0 1,999 to several conditions to meet a monovalent radical of the formula CqH2qL, wherein q is an integer value of 2 to 8 and L is selected from the following groups: -N (R2) CH2-CH2-N (R2) 2 "N (R2) 2; -N (R2) 3A ^; -N (R2) CH2-CH2-NR2H2A ^; wherein R2 is hydrogen, phenyl, benzyl, or a saturated hydrocarbon radical, preferably alkyl from about C1 to about C2tl ; A_ is a halide in one embodiment, the terminal amino silicone described above conform to the formula III, wherein G is methyl ^ is I;. b is I; n is a number from 200 to 1000 for the conditions correspond to the general formula CqH2qL monovalent radical, wherein q is an integer having a value from 2 to 8 and L is selected from the following groups: _N (R2) CH2-CH2-N (R2) 2 -N (R2) 2; -N ( R2) 3A ^ -N (R2) CH2-CH2-NR2H2A ^; wherein R2 is alkyl from about C1 to about C2tl; A_ is a halide. 所述组合物还可包含去头皮屑活性物质。 The  compositions may also contain anti-dandruff active. 去头皮屑活性物质可选自:抗微生物活性物质、吡啶硫酮盐、唑、硫化硒、粒状硫、角质层分离酸、水杨酸、羟甲辛吡酮(羟甲辛吡酮乙醇胺)、煤焦油，以及它们的组合。 Anti-dandruff active selected from: antimicrobial actives, pyridinethione salts, azoles, selenium sulfide, particulate sulfur, keratolytic acid, salicylic acid, octopirox (piroctone amine), coal tar, and combinations thereof. 所述组合物可包含吡啶硫酮锌(ZPT)。 The composition may comprise zinc pyridinethione (ZPT). 吡啶硫酮去头皮屑剂描述于例如US2，809，971中。 Pyridinethione anti-dandruff agents are described for example in US2,809,971. 去头皮屑活性物质的浓度按所述组合物的总重量计可为约0.01重量％至约5重量％,或约0.1重量％至约3重量％,或约0.1重量％至约2重量％。 Anti-dandruff active substance concentration of total weight of the composition, may be from about 0.01% to about 5 wt%, or from about 0.1 wt% to about 3 wt%, or from about 0.1 wt% to about 2% by weight. 所述组合物可包含湿润剂。 The  composition may contain a wetting agent. 湿润剂可选自:多元醇、水溶性烷氧基化非离子聚合物，以及它们的混合物。 Selected from wetting agents: polyhydric alcohols, water soluble alkoxylated nonionic polymers, and mixtures thereof. 当用于本文时，湿润剂的用量按所述组合物的总重量计优选为约0.1%至约20%，更优选约0.5%至约5%。 As used herein, the total amount of humectant by weight of the composition is preferably from about 0.1% to about 20%, more preferably from about 0.5% to about 5%. 所述组合物还可包含混悬剂，其浓度有效地悬浮所述组合物中分散形式的水不溶性材料，或调节所述组合物的粘度。  The composition may further comprise a suspension in a concentration effective to form a suspension of dispersed water-insoluble material, the composition, or to adjust the viscosity of the composition. 混悬剂的浓度按所述组合物的总重量计可在约0.1%至约10%，或约0.3%至约5.0%范围内。 Concentration of the suspension total weight of the composition, may range from about 0.1% to about 10%, or from about 0.3% to about 5.0%. 所述混悬剂可为阴离子聚合物和/或非离子聚合物(例如乙烯基聚合物、酰基衍生物、长链胺氧化物，以及它们的混合物、脂肪酸链烷醇酰胺、长链链烷醇酰胺的长链酯、甘油酯、具有至少约16个碳原子的脂肪烷基部分的伯胺、具有两个各具有至少约12个碳原子的脂肪烷基部分的仲胺)。 The anionic polymer may be a suspension and / or non-ionic polymer (e.g. vinyl polymers, acyl derivatives, long chain amine oxides, and mixtures thereof, fatty acid alkanolamides, long-chain alcohol esters of long chain amides, esters, primary amines having a fatty alkyl moiety of at least about 16 carbon atoms, each secondary amines having two fatty alkyl moiety having at least about 12 carbon atoms). 混悬剂的实例描述于US4，741，855中。 Examples of suspending agents are described in US4,741,855. 所述组合物可为可倾倒液体的形式(在环境条件下时可倾倒)。  The composition may be in the form of a pourable liquid (pourable under ambient conditions when). 因此，此类组合物通常包含美容上可接受的含水载体，其含量为约20%至约95%，或约60%至约85%。 Thus, such compositions typically comprise a cosmetically acceptable aqueous carrier in an amount of from about 20% to about 95%, or about 60% to about 85%. 在一个实施方案中，所述组合物还包含美容上可接受的含水载体，并且所述组合物为可倾倒液体的形式。 In one embodiment, the composition further comprising a cosmetically acceptable aqueous carrier, and the composition is in the form of a pourable liquid. 美容上可接受的含水载体可选自:水以及低级烷基醇与多元醇的水溶液。 Cosmetically acceptable aqueous carrier selected from: an aqueous solution of water and lower alkyl alcohols and polyhydric alcohols. 低级烷基醇可为具有I个至6个碳的一元醇。 Lower alkyl alcohols may be monohydric alcohols having from I to 6 carbons. 在一个实施方案中，低级烷基醇为乙醇和异丙醇。 In one embodiment, the lower alkyl alcohol is ethanol and isopropanol. 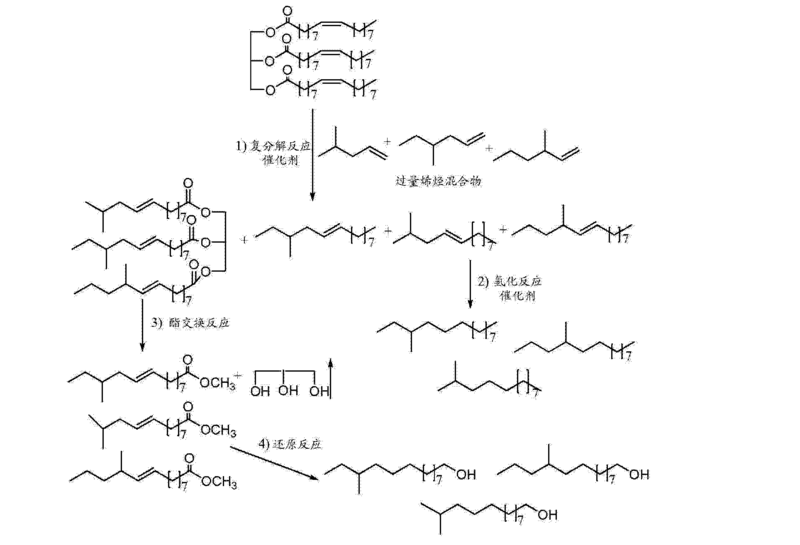 多元醇可为丙二醇、己二醇、甘油和丙二醇。 Polyhydric alcohols may be glycol, hexylene glycol, glycerol and propylene glycol. 上文阳离子表面活性剂与高熔点脂肪族化合物和含水载体一起可在组合物中形成凝胶基质。  The above cationic surfactant and the high melting point fatty compounds and aqueous carrier, may form a gel matrix in the composition. 所述凝胶基质适于提供多种调理有益效果，如在施用到湿发期间提供光滑感，并且在干发上提供柔软性和湿润感。 The gel matrix is ​​suitable for providing various conditioning benefits such as slippery feel during the application to wet hair and softness and moisturized provide on dry hair. 为了提供上述凝胶基质，以一定含量包含阳离子表面活性剂和高熔点脂肪族化合物，使得阳离子表面活性剂与高熔点脂肪族化合物的重量比在或约1:1至约1:10，或约1:1至约1:6范围内。 In order to provide the above gel matrix, to contain a content of cationic surfactants and high melting point fatty compound, such that the weight of surfactant and the high melting point fatty compound or a cationic ratio of from about 1: 1 to about 1:10, or from about 1: 1 to about 1: 6 within the range. 可由多种测试方法测定凝胶网络或凝胶基质的存在，所述方法包括SAXS和DSC(差示扫描量热法)分析性测试方法。 Determination of the presence of the test method by gel network or gel matrix, the method comprising SAXS and DSC test methods (differential scanning calorimetry). 卜素颜料、三苯甲烷颜料、三芳基甲烷颜料、氧杂蒽颜料、喹啉颜料、嘯嗪颜料、吖嗪颜料、蒽醌颜料、靛青类颜料、硫堇靛青类颜料、喹吖啶酮颜料、酞菁颜料、植物性颜料、天然颜料，包括:水溶性组分如具有C.1.名称的那些。 Bu prime pigments, triphenylmethane pigments, triarylmethane pigments, xanthene pigments, quinoline pigments, Xiao dioxazine pigment, azine pigment, anthraquinone pigment, indigoid pigment thionine indigoid based pigments, quinacridone pigments , phthalocyanine pigments, plant pigments, natural pigments, including: water soluble components such as those having C.1 name. 所述组合物可包含约0%至约5%的颜料材料。 The composition may comprise from about 0% to about 5% of a pigment material. 所述组合物可包含约0%至约5%的抗微生物剂。 The composition may comprise from about 0% to about 5% of an antimicrobial agent. 所述组合物可具有约6至约10，或约7至约10，或约7至约9的pH。 The composition may have from about 6 to about 10, or from about 7 to about 10, or from about 7 to about pH 9. 在一个实施方案中，所述组合物基本上不含起泡期间减缓表面活性剂向气-水和/或污垢-水界面迁移的化合物。 Slowing surfactant to air during  In one embodiment, the composition is substantially free of blistering - and water or dirt / - compound water interface migration. 在一个实施方案中，所述组合物包含小于约0.5重量％的聚丙烯酸酯缔合增稠剂和三羟基硬脂酸甘油`酯聚合增稠剂，或基本上不含聚丙烯酸酯缔合增稠剂和三羟基硬脂酸甘油酯聚合增稠剂。 In one embodiment, the composition comprises less than about 0.5% by weight of associative thickeners of polyacrylate and tri-hydroxystearic acid glyceryl ester `a polymeric thickener, or substantially free of polyacrylate associative by thickeners and polymeric thickeners trihydroxystearin. 聚丙烯酸酯缔合增稠剂的实例包括具有商品名Carbomer的那些。 Examples of associative thickener polyacrylic acid esters include those having the trade name Carbomer. ThixcillR'为三羟基硬脂酸甘油酯聚合增稠剂的实例。 ThixcillR 'is trihydroxystearin examples of polymeric thickeners. 第一方面还可包括向毛发提供并且施用毛发护理和/或毛发定型组合物。  The first aspect may further include providing and administering to the hair a hair care and / or hair styling composition. 此外或作为另外一种选择，它可包括提供用于向毛发施加定型效果的工具。 Additionally or alternatively, it may comprise providing means for applying the styling to the hair. 本发明的第二方面涉及清洁毛发的组合物，其中所述组合物包含约3重量％至约35重量％的如上所述的至少两种式I的化合物的混合物。  The second aspect relates to a hair cleaning compositions of the present invention, wherein the composition comprises a mixture of at least two compounds of formula I is about 35 wt% to about 3% by weight as described above. 在一个实施方案中,所述组合物溶解于具有约0.1秒至约300秒的溶解时间的水基溶剂中。 In one embodiment, the composition is dissolved in a water-based solvent having a dissolution time of about 0.1 seconds to about 300 seconds in. 在一个实施方案中，所述组合物包含至少一种根据式I的直链化合物和至少一种根据式I的支化化合物。 In one embodiment, the composition comprises at least one linear chain compound of Formula I and at least one branched compound according to formula I. 在一个实施方案中，支化化合物选自:10-甲基十二烷基硫酸钠或硫酸铵盐、11-甲基十二烷基硫酸钠或硫酸铵盐、乙氧基化10-甲基十二烷基硫酸钠或硫酸铵盐、1-乙氧基化11-甲基十二烷基硫酸钠或硫酸铵盐，以及它们的混合物。 In one embodiment, the branched compound is selected from: 10-methyl dodecyl sulfate or ammonium sulfate, 11-methyl ammonium salt or sodium lauryl sulfate, 10-methyl ethoxylated sodium lauryl sulfate or ammonium sulfate, 11-methyl-1- ethoxylated lauryl sulfate or ammonium salts, and mixtures thereof. 如上文涉及所述组合物的第一实施方案所公开的实施方案同样涉及第二实施方案的组合物。 Embodiment  As described above relates to the composition of the first embodiment also relates to the disclosed embodiment of the composition of the second embodiment. 本发明的第三方面涉及组合物用于清洁毛发的用途，其中所述组合物溶解于具有约0.1秒至约300秒的溶解时间的水基溶剂中，其中所述组合物包含约3重量％至约35重量％的如上所述的至少两种式I的化合物的混合物。  The third aspect of the invention relates to the use of compositions for cleaning the hair, wherein said composition is dissolved in a water-based solvent having a dissolution time of about 0.1 seconds to about 300 seconds, where the composition comprises from about a mixture of compounds 35 wt.% to about 3% by weight of the above formula I of at least two. 实施方案涉及组合物用于清洁毛发的用途，其中所述组合物溶解于具有约120秒至约180秒的溶解时间的水基溶剂中，其中所述组合物包含约3重量％至约35重量％的包含至少一种根据式I的直链化合物和至少一种根据式I的支化化合物的组合物,其中所述支化化合物选自:10_甲基十二烷基硫酸钠或硫酸铵盐、11-甲基十二烷基硫酸钠或硫酸铵盐、乙氧基化10-甲基十二烷基硫酸钠或硫酸铵盐、1-乙氧基化11-甲基十二烷基硫酸钠或硫酸铵盐，以及它们的混合物；并且其中所述直链化合物与支化化合物的重量比(直链:支化)为约4.5:1至约1.75:1。  The embodiment relates to use of the composition for cleansing the hair, wherein said composition is dissolved in a water-based solvent having a dissolution time of about 120 seconds to about 180 seconds, where the composition comprises from about 3 wt% to comprising about 35 weight percent of at least one linear according to formula I and at least one compound of the composition according to branched compounds of formula I, wherein the branched compound is selected from: methyl dodecyl sulfate 10_ or ammonium sulfate, 11-methyl ammonium salt or sodium lauryl sulfate, 10-methyl ethoxylated ammonium sulfate or sodium dodecyl sulfate, 11-methyl-1- ethoxylated ten dialkyl ammonium or sodium salts, and mixtures thereof; and wherein the weight of the branched and linear compounds ratio of compound (linear: branched) is from about 4.5: 1 to about 1.75: 1. 如上文涉及所述组合物的第一实施方案所公开的实施方案同样涉及如第三实施方案所述的组合物的用途。 Embodiment  As described above relates to the composition of the first embodiment of the disclosed embodiment relates to the use of the same composition as in the third embodiment of the embodiment. 支化化合物可通过复分解反应合成。  branched compounds may be synthesized by the metathesis reaction. 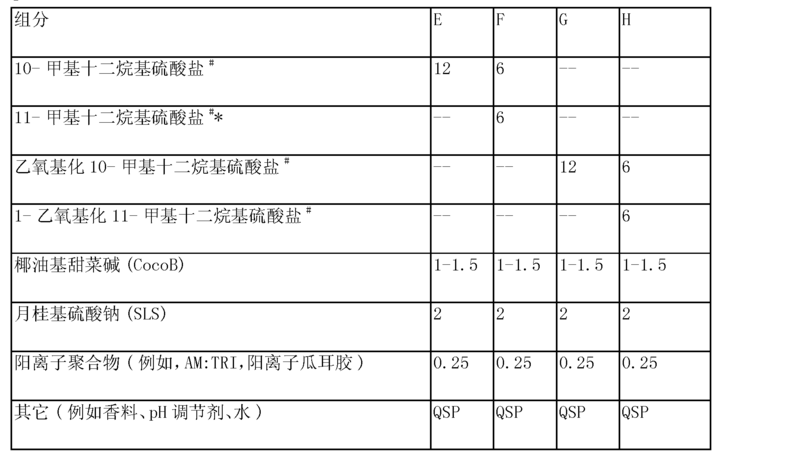 可用的机理还论述于Suguro和Mori (1979)的“Agric.Biol.Chem.”(43(4),869) ; Yuasa 和Tsuruta (2004)的“Flavour Fragr.J.”(19,199)中。 Also discussed the mechanism available to Suguro and Mori (1979) of "Agric.Biol.Chem." (43 (4), 869); and in Yuasa Tsuruta (2004) of "Flavour Fragr.J." (19,199). 此外，经由遗传工程细菌的制备论述于US2010/0105955 ;US2010/0105963 ;W02007/136752 ；W02008/119082 ；W02009/111672 ;和US61/289039 中。 Moreover, genetic engineering of bacteria via preparative discussed in US2010 / 0105955; US2010 / 0105963; W02007 / 136752; W02008 / 119082; W02009 / 111672; and US61 / 289039. 反应物及其随后产物可来源于以下油:三油酸酯(示于方案I中)、大豆油(氢化的)、油菜籽油、低芥酸菜籽油、棕榈油、棕榈仁油、椰油、麻风树油、高芥酸油菜籽油、棉籽油、牛油、黄牛油、玉米油、向日葵油、巴巴苏油，以及它们的混合物。  The reactants and their subsequent products may be derived from the following oils: trioleate (shown in Scheme I), soybean oil (hydrogenated), rapeseed oil, canola oil, palm oil, palm kernel oil, coconut oil, jatropha oil, high erucic acid rapeseed oil, cottonseed oil, tallow, cattle oil, corn oil, sunflower oil, babassu oil, and mixtures thereof. 用于复分解反应中的烯烃可为单一支链烯烃，或支链烯烃的混合物，或支链烯烃与其它非反应性杂质如芳族烷烃、石蜡、支化石蜡和环烷烃的混合物。 For olefin metathesis reaction may be a single alkene, or a mixture of branched olefins, or such as aromatic hydrocarbons, paraffins, a mixture of branched olefins and branched paraffins and other non-reactive impurities cycloalkane. LA.近端支化醇混合物的合成:将约8.854g(0.01Omol)三油酸甘油酯(Sigma目录号17140)和25mL己烷放置于316不锈钢搅拌压力容器中。  LA proximal branched alcohols synthesis mixture: About 8.854g (0.01Omol) triolein (Sigma Catalog No. 17140) and placed in a 316 stainless steel 25mL hexane was stirred pressure vessel. 溶剂和三油酸甘油酯在加入到容器中之前，在4A分子筛上预干燥。 Triolein and solvent prior to addition to the vessel, in the pre-dried 4A molecular sieves. 将约0.0006mol六氯化钨和0.0006mol四甲基锡加入到容器中。 Tungsten hexachloride and about 0.0006mol 0.0006mol tetramethyl Ji Xijia into the container. 将反应器密封、搅拌，并且用N2吹扫几次。 The reactor was sealed, stirred, and purged with N2 several times. N2下将约0.030mol3-甲基-1-己烯、4-甲基-1-己烯和4-甲基-1-戊烯的共混物加入到容器中。 About 0.030mol3- under N2-methyl-1-hexene, 4-methyl-1-hexene and 4-methyl-1-pentene was added to the blend vessel. IOOpsig N2下将搅拌的混合物加热至220°C，并且在该温度下保持几小时。 Under IOOpsig N2 The stirred mixture was heated to 220 ° C, and held at this temperature for several hours. 将反应器冷却并且取出产物。 The reactor was cooled and the product removed. 反应混合物用2-3mL浓氢氧化铵淬灭，并且用附加的IOmL己烷萃取。 2-3mL reaction mixture was quenched with concentrated ammonium hydroxide, and extracted with additional hexane IOmL. 在旋转蒸发器上除去己烷和残余的任何挥发性烯烃。 Hexane and removing any residual volatile olefin on a rotary evaporator. 使剩余产物经历分馏以移除残留的非挥发性烯烃混合物。 The remaining product is subjected to fractionation to remove residual non-volatile olefin mixture. 将主要包含11-甲基-9-十四烯、12-甲基-9-是三烯和12-甲基-9-十四烯的混合物的该支链烯烃混合物在标准反应条件下氢化，以获得高质量的支化半生物柴油燃料。 Containing mainly 11- methyl-9-tetradecene, 12-methyl-9 which is a mixture of branched olefins and a mixture of 12-methyl-9-tetradecene triene hydrogenated under standard reaction conditions, to obtain high quality half-branched biodiesel fuel. 经历蒸馏的烧瓶底部主要包含新支化的甘油三酯混合物。 Bottom flask was subjected to distillation mixture of triglycerides mainly containing new branched. 使该新甘油三酯混合物在甲醇和催化量氢氧化钠或甲醇钠的甲醇溶液的存在下经历标准酯交换条件。 The new mixture was subjected to a standard triglyceride transesterification conditions, and a catalytic amount of sodium hydroxide in methanol or in the presence of sodium methoxide methanol solution under. 混合物相分离成甘油(底层相)和甲酯混合物(顶层相)，所述甲酯混合物主要包含12-甲基-9-十四碳烯酸甲酯、12-甲基-9-十三碳烯酸甲酯和11-甲基-9-十四碳烯酸甲酯。 The mixture separated into glycerol phase (bottom layer) and a mixture of methyl (top phase), the mixture comprising predominantly methyl 12- methyl-9-methyl-tetradecene, 12-methyl-9-Tridecane and 11-methyl-9-enoate tetradecene methyl. 采用标准方法，在氢气存在下用亚铬酸铜催化剂还原独特的支化甲酯混合物，基本上获得12-甲基十四烷-1-醇、12-甲基十三烷-1-醇和11-甲基十四烷-1-醇的混合物。 Using standard methods, in the presence of hydrogen reduction of copper chromite catalysts with a unique mixture of methyl esters of branched, substantially to obtain 12-methyl-1-ol tetradecane, tridecane, 12-methyl-1-ol 11 - a mixture of tetradecyl methyl-1-ol. 将所述混合物真空蒸馏以提供纯化的混合物。 The mixture was vacuum distilled to provide purified mixture. 1.B.磺化:向具备搅拌和驱除空气的N9扫气的反应容器中填充22.1克(约0.1mol)根据实施例1.A.制得的近端醇混合物。  1.B. sulfonation: filling a reaction vessel equipped with a stirrer and a scavenging air purge N9 22.1 g (about 0.1 mol) The obtained alcohol mixture produced in Example 1.A. proximal end. 加入50mL乙醚。 50mL of diethyl ether was added. 将混合物冷却至_5°C。 The mixture was cooled to _5 ° C. 然后滴加12.23克(0.105mol)氯磺酸，同时保持混合物温度低于10°C。 Then a solution of 12.23 g (0.105 mol) of chlorosulfonic acid, while maintaining the mixture temperature below 10 ° C. 施加真空以移除释出的HCl气体，同时使混合物升温至~30°C。 Applying a vacuum to remove the liberated HCl gas while the mixture was warmed to ~ 30 ° C. 由于乙醚挥发，将乙醚补偿两次，同时持续混合两小时。 Since the ether was evaporated, and diethyl ether twice to compensate, while continuing mixing for two hours. 然后在进行下一步之前，真空移除乙醚。 Before proceeding Then, ether was removed in vacuo. 在搅拌下将所得混合物缓慢加入到在冰浴中冷冻的不锈钢烧杯中，所述烧杯包含22.68g25%甲醇钠的甲醇溶液(0.105mol)。 The resulting mixture was under stirring slowly added to a chilled in an ice bath stainless steel beaker, the beaker containing 22.68g25% methanol solution of sodium methoxide (0.105mol). 将混合物搅拌一小时，然后倒入到不锈钢托盘中。 The mixture was stirred for one hour, then poured into a stainless steel tray. 然后蒸发溶剂，并且使用真空炉进一步干燥样品。 Then solvent was evaporated and the sample further dried using a vacuum oven. 获得近端支化醇硫酸盐表面活性剂。 Branched alcohols obtained proximal sulfate surfactants. 1.C.近端支化醇乙氧基化物:在适宜的时间内并且以可控的方式，向搅拌着的具备冷却旋管的600mL不锈钢压力容器中加入223.7克(1.0mol)上文实施例1.A.中的近端醇混合物，以及足量的催化剂以促进醇与环氧乙烷的反应。  1.C. proximal end of the branched alcohol ethoxylates: and in a controlled manner, to a stirred solution of 600mL stainless steel pressure vessel equipped with a cooling coil was charged with 223.7 g (1.0 mol) within an appropriate time Example 1.A. proximal end of the alcohol mixture, and a sufficient amount of catalyst to promote the reaction of the above embodiment the alcohol with ethylene oxide. 适宜的催化剂是1.1克由50%氢氧化钾水溶液组成的溶液。 Suitable catalysts are the solution of 1.1 g of 50% potassium hydroxide aqueous solution thereof. 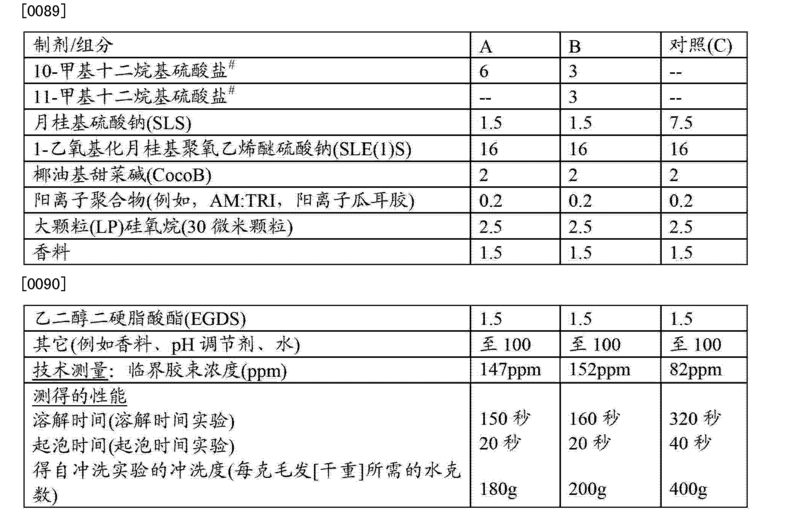 可使用其它类型和数量的催化剂。 Other types and amounts of catalysts may be used. 当使用水泵作为真空源时，在不使实施例LA.的近端醇混合物损失的温度下(一般介于40°C和90°C之间，但是优选介于约60°C和约80°C之间)，将反应器加热，同时施加真空以移除与催化剂一起引入的造成副产物的物质如水。 When using the pump as a vacuum source, in an embodiment without LA. The proximal alcohol mixture temperature loss (generally between 40 ° C and 90 ° C, but preferably between about 60 ° C and about 80 ° C between), the reactor is heated while vacuum is applied to remove the introduced together with the catalyst caused by substances such as water by-product. 通过采用一般约50rpm的低速搅拌，同时用少量(滴流)惰性气体流通过底部排放阀或通过不锈钢气体分散熔块或任何惰性浸料管或烧结金属熔块材料搅动所述混合物，或通过用惰性气体在所述混合物上方吹扫来促进水的移除。 By using low speed agitation typically about 50rpm, but with a small amount (trickle) an inert gas stream through the bottom drain valve or a dip tube dispersion through a stainless steel frit or any inert gas or a sintered metal frit material, agitating the mixture, or by treatment with inert gas purging in the above mixture to facilitate removal of water. 从反应器中取样，并且使用适当的分析方法如Karl-Fischer滴定法分析水含量。 Samples were taken from the reactor and analyzed as the water content using the Karl-Fischer titration method suitable analytical method. 在水移除步骤结束后，如果合理设计反应器系统以阻止非受控的反应速率，可一次全部加入亚乙基氧。 At the end of the water removal step, if the rational design of the reactor system to prevent uncontrolled rate of reaction, all at once ethyl Jia Ruya oxygen. 然而，通过首先在静态真空(或任选具有来自惰性气体如N2的附加压力)下将反应器加热至适于醇-催化剂混合物与环氧乙烷反应发生并且使副产物和颜色的产生最小化的温度(一般介于85°和150°C之间，但是优选介于约110°C和130°C之间)，获得最佳反应控制。 However, by first under static vacuum (or optionally with additional pressure from an inert gas such as N2) The reactor is heated to a suitable alcohol - minimum catalyst mixture is reacted with ethylene oxide and the occurrence of by-products and color of temperature (generally between 85 ° and 150 ° C, but preferably between about 110 ° C and 130 ° C), the best control of the reaction. 当反应器达到所需温度时，以一定速率加入308克(7.0mol)环氧乙烷，所述速率由冷却体系控制，一般在30分钟至60分钟期间内。 When the reactor reaches the desired temperature, was added at a rate 308 g (7.0 mol) of ethylene oxide, the rate is controlled by the cooling system, typically over a period of 30-60 minutes. 在环氧乙烷加料完成后，持续搅拌和加热直至环氧乙烷已被反应消耗掉。 After the ethylene oxide addition is complete, stirring and heating continued until the ethylene oxide has been consumed the reaction. 然后产物可除去气体并从反应容器中移出，按原样贮藏或长期贮藏，用一当量酸中和催化剂，所述酸选自柠檬酸、HCl或硫酸。 The product can be removed and the gas is then removed from the reaction vessel, long-term storage or storage as is, with one equivalent of an acid catalyst, the acid is selected from citric acid, HCl or sulfuric acid. 可过滤中和产物以除去任何固体残留物。 And the product may be filtration to remove any solid residue. 表面活性剂现已准备就绪。 Surfactant is now ready. 皿:*=可经由油基油与3-甲基-1-丁烯的复分解反应获得；#=钠盐或铵盐；QSP=对于100%适量；无单位值以重量％为单位。  pan: * = base oil may be obtained via a metathesis reaction of methyl-1-butene with 3; # = sodium or ammonium salt; QSP 100% = amount; unitless value in wt .-% . 可将硅氧烷、SLS和E⑶S从任何组合物AF中移除以获得澄清的洗发剂。  The silicone may, SLS and E⑶S removed to obtain a clear shampoo composition from any of the AF. 溶解时间实验:将0.5克组合物(包含总计0.13g表面活性剂)放置在标准载玻片(Corning2947MicroSlides)上。  The dissolution time of the experiment: 0.5 g of the composition (comprising a total of 0.13g surfactant) is placed on a glass slide standard (Corning2947MicroSlides). 使覆盖组合物的载玻片在环境条件下平衡I分钟。 Slides were covered with the composition I balance minutes at ambient conditions. 然后将包含产品的载玻片悬浮于包含IL水(保持在34°C +/-2°C )的烧杯中。 The slides containing the product was then suspended in water containing IL (maintained at 34 ° C +/- 2 ° C) in a beaker. 以400rpm的速率可重现地搅拌溶液(IKA BigSquidl500RPM搅拌器)。 At a rate of 400rpm solution may be stirred (IKA BigSquidl500RPM stirrer) reproducibly. 将电导率探针插入到溶液中。 The conductivity probe is inserted into the solution. 溶液的电导率随着产物的溶解而升高。 As the conductivity of the solution is raised lysate. 然后记录将载玻片放入水中时起至电导率量度保持恒定(产物完全溶解)的时间。 Recording until the conductivity measurement is then kept constant (product of complete dissolution) time of the slides placed in water. 以溶解所需的秒数示出结果。 Was dissolved in a number of seconds shows the results. 0.19克表面活性剂)施用到发簇中央；然后将发簇的下部在毛发上的组合物上以圆周运动揉搓5个行程，以均匀地分配组合物。 0.19 g surfactant) was applied to the hair switch center; then on a lower portion of the hair switches composition on the hair rubbing in a circular motion travel 5, to evenly distribute the composition. 然后以前后运动方式揉擦40个循环。 Then after rubbing motion before 40 cycles. 由泡沫体积达到消费者相关量(200mL泡沫)所需的时间(秒)来测定起泡难易性。 To determine the time required for ease of foaming (200mL foam) (sec) to achieve a foam volume of consumer-related quantity. 冲洗实验(以可控速率冲洗毛发时测得的毛发上的摩擦力):将四克8英寸长的发簇合并于发簇夹中，用40°C和典型硬度(9-10gpg)的水控制润湿十秒，以确保完全且均匀的润湿。  Experimental flushing (frictional force measured at a controlled rate of hair during rinsing hair): The four grams 8 inches long hair tufts combined in the folder hair switch, using 40 ° C and typical hardness (9-10gpg ) control water wetting ten seconds, to ensure complete and uniform wetting. 将组合物自夹子下方一英寸处起朝向末端，以0.1克组合物(包含总计0.026克表面活性剂)每克干发(0.1克每克毛发，或2克每20克毛发)的量均匀施用在合并发簇的长度方向上。 The composition from one inch below the clip toward the end, 0.1 g of composition (comprising a total of 0.026 g of surfactant) per gram of dry hair (0.1 g per gram of hair, or 2 grams per 20 gram of hair) is uniformly applied in the longitudinal direction of the combined hair switch. 就更浓缩的样品而言，将用量减至0.05克每克毛发(总计0.013g表面活性剂)。 More concentrated sample, the amount to 0.05 grams per gram of hair (0.013g total surfactant). 通过典型为消费者采用的揉搓运动使发簇组合起泡30秒，并且用以1.5gal/min流动且40°C的水冲洗(处理毛发)以确保30秒完成。 Kneading motion by typical consumers to make use of a combination of foaming hair switch for 30 seconds, and for 1.5gal / min and the flow of rinsing water of 40 ° C (hair treatment) to ensure complete in 30 seconds. 然后开始冲洗，同时经由负载传感仪器如Instron或TA-XT测定毛发摩擦力。 Then start of flushing, while hair friction was measured via the load sensing instruments such as Instron or TA-XT. 冲洗期间，如上控制水流速，并且负载传感仪器的行程示出摩擦力随着毛发上洗发剂的移除而增加。 During flushing, the water flow rate control as described above, the stroke and the load sensing instrument removed illustrating the frictional force with increasing hair shampoos. 更快速达到指示组合物被完全冲洗掉的消费者相关摩擦力nooo克力)的组合物需要较少的水。 More quickly reach indicating composition is completely rinsed out of consumer-related friction nooo chocolate) composition requires less water. 以达到该摩擦力所需的水克数为单位记录结果。 G of the desired number of water to achieve the frictional force results in units of records. 根据图1，基于以下测量进行计算:每个行程为12秒，并且水流速为400mL/min.可发现代表毛发上组合物冲洗结束的消费者相关摩擦力点(此处为1000g力)、达到该力所需的行程数，并且计算该行程数后使用的水量。 According to FIG. 1, is calculated based on the following measurement: 12 seconds per stroke, and the water flow rate of 400mL / min compositions can be found on the hair was rinsed representative of the end points of consumer-related friction (1000g force here), to achieve this. number of strokes required force, and calculates the amount of water used after the number of strokes. 例如，10个行程代表120秒，代表800克水。 For example, 10 representative of the stroke 120 seconds, representing 800 g of water. 发簇重4克。 Hair switches weighs 4 grams. 800克水变成200克水/g毛发。 800 g water into 200 g of water / g of hair. 本文所公开的量纲和值不应当被理解为严格限于所引用的精确值。  As used herein disclosed dimensions and values ​​it should not be understood as being strictly limited to the exact numerical values ​​recited. 相反，除非另外指明，每个这样的量纲均旨在既表示所引用的值，也表示围绕此值的功能上等同的范围。 Instead, unless otherwise specified, each such dimension is intended to mean both the value quoted, also said around a functionally equivalent value of this range. 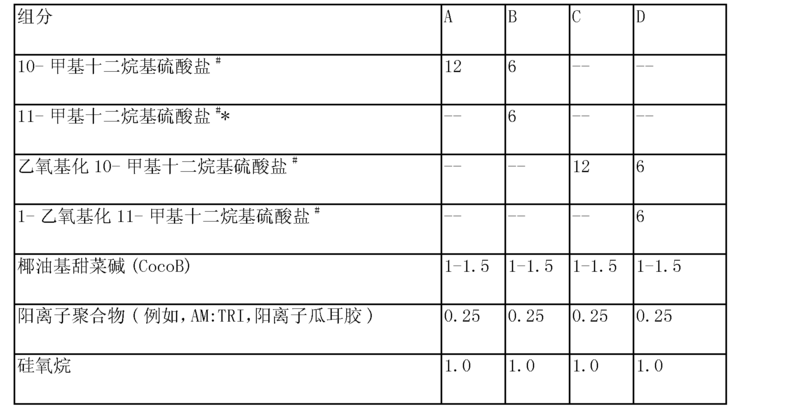 例如，公开为“40mm”的量纲旨在表示“约40mm”。 For example, the public is "40mm" dimension is intended to mean "about 40mm". 其中R1为氢、甲基或乙基；R2为具有0、1、2或3个(C1-C3)烷基支链的(C1-Cn)烷基或(C1-Cn)烯基，其中支化出现在碳主链的未官能化端的40%范围内的碳原子上；m为5-37且n为1-33，其中m+n为6_38 ；Y不存在或为Wp ;W选自乙烯氧基、丙烯氧基、丁烯氧基，以及它们的混合物；p为I至30 ;Z为选自以下的亲水部分:羟基、羧酸根、硫酸根、二硫酸根、磺酸根、二磺酸根、甘油酯磺酸根、胺、单烷基胺、二烷基胺、氧化胺、多羟基部分、磷酸酯、甘油磺酸根、聚葡糖酸根、聚磷酸酯、膦酸根、磺基琥珀酸根、磺基琥珀酰胺酸根、葡糖酰胺、牛磺酸根、肌氨酸根、甘氨酸根、羟乙基磺酸根、二链烷醇酰胺、单链烷醇酰胺、单链烷醇酰胺硫酸根、二甘醇酰胺、二甘醇酰胺硫酸根、甘油酯、甘油酯硫酸根、甘油醚、甘油醚硫酸根、聚甘油醚、聚甘油醚硫酸根、脱水山梨糖醇酯、烷基 Wherein R1 is hydrogen, methyl or ethyl; R2 is (C1-Cn) alkyl or (C1-Cn) an alkenyl group having 2 or 3 (C1-C3) branched alkyl wherein the branched carbon atoms in the range of 40% of the carbon present in the main chain end of the unfunctionalized; m is 5-37 and n is 1-33, wherein m + n is 6_38; Y is absent or Wp; W is selected from ethylene group, propylene group, butylene group, and mixtures thereof; p is I to 30; Z is a hydrophilic moiety selected from: hydroxyl, carboxylate, sulfate, dimethyl sulfate, sulfonate, bis sulfonamide phosphonate, sulfonate esters, amines, monoalkyl amines, dialkyl amines, amine oxides, polyhydroxy part, phosphate esters, glycerol sulfonates, polyethylene gluconate, polyphosphate, phosphonate, sulfosuccinate, sulfosuccinamates acid radical, glucamides, taurine root, root sarcosine, glycinate, isethionate, dialkanolamides, monoalkanolamides, monoalkanolamide sulfates, diethylene glycol amides, diethylene glycol amide sulfate, glycerides, glyceride sulfates, glycerol ethers, glycerol ether sulfates, polyglycerol ethers, polyglycerol ether sulfates, sorbitan esters, alkyl 聚葡糖苷、脲、氨基烷烃磺酸根、酰胺丙基甜菜碱、烯丙基化季铵盐、烯丙基化/多羟基烷基化季铵盐、烷基化季铵盐、烷基化/多羟基化氧丙基季铵盐、甘油酯季铵盐、甘醇胺季铵盐、咪唑啉、链烯-2-基-琥珀酸根、磺化烷基酯和磺化脂肪酸； 其中相对于所述化合物中的至少一种:当R1为H时，则R2具有1、2或3个(C1-C3)烷基支链，并且当R1为甲基或乙基时，则R2具有0、1或2个(C1-C3)烷基支链。 Polyglycosides, urea, amino alkane sulfonate, amide betaine, allylated quaternary ammonium salts, allylated / polyhydroxy alkyl quaternary ammonium salts, alkyl quaternary ammonium salts, alkylated / oxopropyl polyhydroxylated quaternary ammonium salts, ester quaternary ammonium salts, quaternary amines glycol, imidazoline, 2-alkenyl - succinate, sulfonated alkyl esters, and sulfonated fatty acids; wherein the relative at least one of said compounds: when R1 is H, R2 is 1, 2 or 3 (C1-C3) branched alkyl, and when R1 is methyl or ethyl, R2 is 0,1 having or 2 (C1-C3) alkyl branching. 2.如权利要求1所述的方法，其中在所述冲洗期间，每克毛发(干重)使用总计约120克至约270克，优选140克至约250克，更优选150克至约240克，甚至更优选约160克至约230克，甚至更优选约170克至约210克，最优选约180克至约200克的水基溶剂。 2. The method according to claim 1, wherein during the rinsing, per gram of hair (dry weight) using a total of about 120 grams to about 270 grams, preferably 140 grams to about 250 grams, more preferably from 150 to about 240 grams g, even more preferably from about 160 grams to about 230 grams, and even more preferably from about 170 grams to about 210 grams, most preferably from about 180 grams to about 200 grams of the water-based solvent. 3.如前述权利要求中任一项所述的方法，其中所述组合物包含至少一种根据式I的直链化合物和至少一种根据式I的支化化合物，并且其中在根据式I的直链化合物中=R1为H ;并且R2为(C1-Cn)烷基或(C1-Cn)烯基且在所述碳链上不含支链。 3. A method as claimed in any one of the preceding claims, wherein said composition comprises at least one compound of formula I according to the linear and branched according to at least one compound of Formula I, and wherein in the formula I linear compound = R1 is H; and R2 is (C1-Cn) alkyl or (C1-Cn) alkenyl group and no branching on the carbon chain. 4.如权利要求3所述的方法，其中所述直链化合物与支化化合物的重量比(直链:支化)为约10:1至约1:2，优选约5:1至约1:1，更优选约4.5:1至约1.75:1，最优选约3.5:1至约2.5:1。 4. The method according to claim 3, wherein said linear weight of the branched compound with a compound ratio (linear: branched) is from about 10: 1 to about 1: 2, preferably from about 5: 1 to about 1 : 1, more preferably from about 4.5: 1 to about 1.75: 1, most preferably from about 3.5: 1 to about 2.5: 1. 5.如权利要求3或4所述的方法，其中所述支化化合物选自:近端支化化合物；中链支化化合物；以及它们的混合物，优选所述支化化合物为近端支化化合物。 5. A method as claimed in claim 3 or claim 4, wherein the branched compound is selected from: the proximal end of the branched compound; mid-chain branched compounds; and mixtures thereof, preferably said proximal end of the branched compound is a branched compound. 6.如前述权利要求中任一项所述的方法，其中所述组合物还包含美容上可接受的含水载体，并且所述组合物为可倾倒液体的形式。 The method according to any one of the preceding claims 6, wherein said composition further comprises a cosmetically acceptable aqueous carrier, and the composition is a pourable liquid form. 7.如前述权利要求中任一项所述的方法，其中所述水基溶剂为至少约50重量％，更优选至少约60重量％，甚至更优选至少约70重量％，甚至更优选至少约80重量％，最优选至少约90重量％的水。 7. A method as claimed in any one of the preceding claims, wherein the water-based solvent is at least about 50 wt%, more preferably at least about 60 wt%, and even more preferably at least about 70% by weight, and even more preferably at least about 80 wt%, most preferably at least about 90% by weight of water. 8.如前述权利要求中任一项所述的方法,其中所述组合物包含约4重量％至约34重量％，优选约5重量％至约30重量％，更优选约10重量％至约28重量％，最优选约20重量％至约25重量％的如权利要求1中所述的至少两种式I的化合物的混合物。 8. The method as claimed in any one of the preceding claims, wherein said composition comprises about 4 wt% to about 34 wt%, preferably from about 5 wt% to about 30 wt%, more preferably about 10 wt% to about a mixture of at least two compounds of formula I in the 128% by weight, most preferably from about 20 wt% to about 25% by weight as claimed in claim. 9.如前述权利要求中任一项所述的方法,其中溶解包括约0.1秒至约300秒，优选约50秒至约250秒，更优选约100秒至约200秒，甚至更优选约120秒至约180秒，最优选约150秒至约160秒的溶解时间。 9. A method as claimed in any one of the preceding claims, wherein the dissolving comprises from about 0.1 seconds to about 300 seconds, preferably from about 50 seconds to about 250 seconds, more preferably from about 100 seconds to about 200 seconds, even more preferably about 120 seconds to about 180 seconds, and most preferably a dissolution time of about 150 seconds to about 160 seconds. 10.如前述权利要求中任一项所述的方法，其中所述起泡包括约0.1秒至约80秒，优选约2秒至约60秒，更优选约5秒至约50秒，最优选约10秒至约30秒的起泡时间，以使包含总计0.19克表面活性剂的组合物达到总计200mL的泡沫体积。 10. The method according to any preceding claim preceding claim, wherein said blister comprises from about 0.1 seconds to about 80 seconds, preferably from about 2 seconds to about 60 seconds, more preferably from about 5 seconds to about 50 seconds, most preferably from about 10 seconds to about 30 seconds of blowing time, so that the composition contains a total of 0.19 g of surfactant foam volume reached 200mL in total. 11.如前述权利要求中任一项所述的方法，其中所述组合物还包含阳离子聚合物，其中所述阳离子聚合物为阳离子表面活性剂，并且其中所述阳离子表面活性剂选自:二十二烷基三甲基氯化铵、二十二烷基三甲基甲酯硫酸铵或二十二烷基三甲基乙酯硫酸铵，以及硬脂基三甲基氯化铵、硬脂基三甲基甲酯硫酸铵或硬脂基三甲基乙酯硫酸铵。 11. The method according to any one of the preceding claims, wherein said composition further comprises a cationic polymer, wherein the cationic polymer is a cationic surfactant, and wherein said cationic surfactant is selected from: two dodecyl trimethyl ammonium chloride, behenyl trimethylammonium methosulfate, behenyl trimethylammonium or ethyl sulfate, and stearyl trimethyl ammonium chloride, stearyl yl methyl sulfate or stearyl trimethyl ammonium methacrylate. 12.如前述权利要求中任一项所述的方法，所述组合物包含小于约0.5重量％的聚丙烯酸酯缔合增稠剂和三羟基硬脂酸甘油酯聚合增稠剂，优选基本上不含聚丙烯酸酯缔合增稠剂和三羟基硬脂酸甘油酯聚合增稠剂。 12. The method according to any one of claims, wherein the composition comprises less than about 0.5% by weight of a polyacrylate thickener and associative polymeric thickeners trihydroxystearin, preferably substantially free polyacrylate thickeners and associative polymeric thickeners trihydroxystearin. 13.如权利要求3至12中任一项所述的方法，其中所述直链化合物为包含12至14个碳原子的阴离子表面活性剂的盐。 3 to 13. The method according to any one of claim 12 wherein the straight chain compound is a salt of the anionic surfactant comprises 12 to 14 carbon atoms. 14.一种用于清洁毛发的组合物，其中所述组合物溶解于具有约0.1秒至约300秒的溶解时间的水基溶剂中，其中所述组合物包含约3重量％至约35重量％的如权利要求1中所述的至少两种式I的化合物的混合物。 14. A composition for cleaning hair, wherein the composition is dissolved in a water-based solvent having a dissolution time of about 0.1 seconds to about 300 seconds, where the composition comprises from about 3% to about 35 wt. a mixture of at least two compounds of the formula I as claimed in claim 1 percent of. 15.组合物用于清洁毛发的用途，其中所述组合物溶解于具有约0.1秒至约300秒的溶解时间的水基溶剂中，其中所述组合物包含约3重量％至约35重量％的如权利要求1中所述的至少两种式I的化合物的混合物。 15. A composition for use in cleaning the hair, wherein said composition is dissolved in a water-based solvent having a dissolution time of about 0.1 seconds to about 300 seconds, where the composition comprises from about 3% to about 35 wt% a mixture of at least two compounds of the formula I as described in claim 1. MX2017013583A (en) 2015-04-23 2018-03-02 Procter & Gamble Hair care regimen using a mechanical foam concentrated conditioner. DE3685769D1 (en) 1985-04-15 1992-07-30 Procter & Gamble Liquid detergent with a oberflaechenaktiven connection, a proteolytic enzyme and borsa yours. MX2009009371A (en) 2007-03-28 2009-09-21 Ls9 Inc Enhanced production of fatty acid derivatives. MX2010014382A (en) * 2008-06-25 2011-02-18 Procter & Gamble Hair conditioning composition containing behenyl trimethyl ammonium methosulfate, and having higher yield point. ES2402853T3 (en) 2013-05-09 Process for preparing soft hydrating fluids containing large oil droplets.